I thought I had the ending right. According to my critique partner, who knows me too well, I had once again typed the climax and made a quick exit from my story. Whenever I write fiction, I consistently wrap things up much too fast. But I think I’ve finally found a cure in the Four Act Structure. You can find a great info-graphic on it here. The Four Act Structure is similar to the 3 Act Structure with a few notable differences. Act 1 is the same in both 3 and 4 Act Structures and comprises ¼ of the manuscript. Readers get to know the characters and the story world. Our heroine receives the call to adventure. The Act ends with the inciting incident that launches her toward adventure. In Hunger Games, this occurs when Prim’s name is selected as tribute and Katniss takes her place. Act 2 and Act 3 from the Four Act Structure correspond with Act 2 in the 3 Act Structure. I’m only going to discuss the 4 Act Structure here. Act 2 once again comprises ¼ of the manuscript. Our heroine gathers her resources for the big fight. This Act ends midway through the story at a momentous point that changes how the heroine thinks about everything that has happened. I think of it as The Big Reveal. In The Hunger Games, Katniss trains throughout Act 2 and enters the arena. The twist occurs when Peeta saves her life and she realizes his love for her isn’t just an act. In Act 3, another ¼ of the manuscript, the true struggle begins. This Act contains the moment where all is lost and then something brings the heroine a glimmer of hope. In The Hunger Games, all is lost when Rue is killed. Author Suzanne Collins breaks the rules, something you can do when it works, by not providing us with that glimmer of hope. Instead, Katniss moves towards the final battle. Act 4, the final ¼, is the same in both structures. It begins with the climax. Afterwards, the heroine reflects on what she has learned about herself. Characters return to the normal world although it may be a new version of normal. The climax of The Hunger Games sets up the rest of the series. Katniss would rather die than kill Peeta, but the story doesn’t end when they are both allowed to live. They are warned about President Snow. We realize her family and society are in danger. We see the head game maker sent to his death. 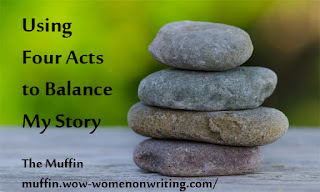 The 4 Act Structure works better for me, because it emphasizes that each act contains equal weight. That means that if Act 3 is 20 scenes, Act 4 should be about the same length. It sounds ridiculous but I need that. Otherwise I can tell myself that the last act is only half the length of the preceding act. It’s supposed to be short. Get off my back. In this version, I don’t have that excuse. If the climax only takes 4 or 5 scenes, I need to take serious some time exploring the resulting world and the changes that have come to it because of my character. No more excuses. I have no clue whether Suzanne Collins plotted it out in three acts or four. Who knows - maybe she's a pantser!